Terrific Tyler comes in multi-tone dark chocolate brown with caramel brown layers and a black stripe effect plush. He has soft boa pads that are complemented with toe stitching, and a dark brown muzzle, brown eyes and white material under them to highlight his lovely gaze. He's wearing a collar and tie. 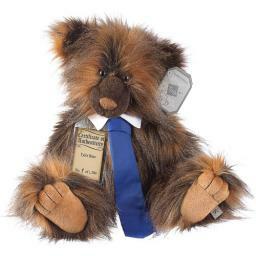 Aswith all the Silver Tag bears, Tyler is fully jointed, substantiallyweighted, and has a classic hump. Tyler comes with an individually numberedCertificate of Authenticity. He is 43.2 cm standing. Tyler is one of 1500. Hecan be spot cleaned.